Hana talks with Danial about things you can do in her hometown of London. Daniel: Hey Hana, how are you? Hana: I’m fine, thank you. Daniel: So tell me, you lived in London, right? Daniel: Well, I’m planning to go to London and I’m really looking forward to it. But I’m not really sure and I don’t really know what to expect and what I can see there, can you tell me a little bit, please? Hana: Yeah, sure. London is a very interesting place. It’s a place where a lot of cultures are mixed. 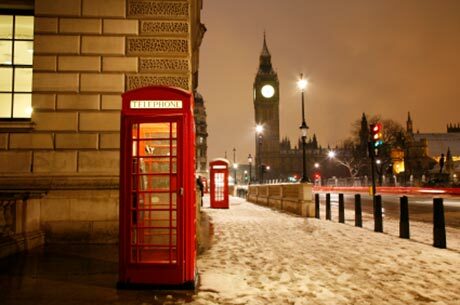 There are lots of historical buildings, for example, Buckingham Palace and Big Ben. There is a very famous museum called the British Museum. And a lot of people come and visit every year. Daniel: That’s really good because I’m really interested in history and I really want to see history there. But is there any other thing that I should see in London or I should try in London, for example, is there any good local British food? Hana: Well, England isn’t very famous for food, but it is famous because a lot of food from different countries is all gathered. For example, there’s a very good place called The Camden Market and you can go and buy food from all over the world. Daniel: Good, that sounds really interesting, really looking forward to it. Thank you. They are looking forward to the party tonight. I'm looking forward to meeting him someday. I’m not really sure and I don’t really know what to expect. She's sure the her team will win the game. I'm not sure if it will rain tomorrow. The teacher explained what to expect this year. I didn't know what to expect from my new job. a lot of food from different countries is all gathered. The crowd gathered outside the building. We gathered some flowers and put them in a vase. You can go and buy food from all over the world. I dropped the cake all over the kitchen floor. Let's everyone together and chat. There are 7-11 stores the city. We to make a profit this year. We are not where he went. I seeing you next week .